This candy ball bubble wrap party game is a crowd pleaser. I’ve played it many times with groups of kids of various ages and it’s always a big it. It’s also a great alternative to using a piñata. The ball is typically filled with candy however, if you don’t want the kids on a sugar rush you can use any small items. For my niece’s spa party we used candy, nail polish, lip gloss and nail stickers. For a boys party you can use hot wheels, bouncy balls and other small figures. You can also make this an active game and fill it with little notes saying do 10 jumping jacks or run around the circle. If you have an adult party, you can fill the ball with items adults may like. 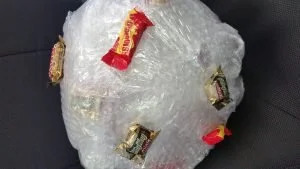 Take a couple pieces of candy and wrap it in a layer of bubble wrap. Use the packing tape to secure. Place some more candy on the bubble wrap, wrap the new candy in a layer of cellophane. I play two ways depending on the age of the kids. 1. Traditional Way- Materials: 2 dice: Have the children sit in a circle. Have one child hold the ball and give another child the dice. The children with the dice has three chances to roll doubles while the other child tries to rip apart the ball. If the child rolling the dice rolls doubles, the child ripping the ball must stop and pass it. If by the third roll of the dice no doubles are thrown then the child must pass the ball. Any candy or item that falls out on their turn, they get to keep. 2. Variation for younger children– Instead of using dice, have the children count to 15 while one is tearing open the ball. Once the children get to 15, the child must pass the ball. You can also make up your own rules and play.